I got out with Glenn who contacted me about riding along for a leadcore and downrigger instructional trip out. I needed to test some tackle and invited him to climb aboard. The day started slow but we were able to find a few fish here and there. We marked a lot of fish eating bait over deeper water from Bald Ridge to Six Mile. We were able to find our fish in the same places I’ve been finding them for the past two weeks. This time they were a little reluctant to hit the jigs. We finally got a call from a buddy I made some big swimbait for and he said they had caught 2 on the big 7 inch swim bait. Glenn and I tied on a 2 ounce Shad Head jig and 7 inch swim Bait body in a Blueback pattern and we had a fish within minutes of dropping the bait back. We also caught 2 nice fish on a chartreuse color. We caught 2 fish on the downriggers, one on a 1 and a half ounce Monster Bucktail in a Cast Away Blueback pattern. The fish we were marking were very very deep which made it tough to troll them up. We were letting out 9 colors of leadcore with a 2 ounce jig in the river channel. That was the ticket to get the bait deep enough. Here’s a little video of the trip. On leadcore I’m using #36 lb test and I’m also using 30-50 feet of 25 lb Big Game clear mono for a leader. I used flouro leaders for the past 2 years and went back to mono leaders. I don’t think the leader type matters much (mono vs flouro). I’ve caught fish on both and don’t see a significant difference in the two. The only difference that makes mono a little better is the fact that mono is tougher than flouro. If I hang a good fish and he takes me to the trees, I’ve got more of a chance of getting the fish out with mono. It has more stretch and is more tolerent to abrasions. When you are using leaders at 30-50 feet at a time, a good mono is far more cost effective than using flouro. I have one Accu-Depth 57LC and a Okuma Classic Pro for my leadcore reels. I don’t pay much attention to the line counter. I use colors to get the bait where I want it. For my downrigger reels I use Accu-Depth 47LC’s. I use 30 lb Big Game green line and a 30-50 foot 25 lb Big Game leader. I don’t really use the line counter for the downrigger applications either. I just run it out about 20-40 feet past the leader and hook it up to the ball. All of my rods are Power Plus Trophy Class 7 footers (med heavy). They are tough and I’ve never had a problem with the rods. They are made for trolling 1/2 ounce to 2 ounce jigs. I’ve also used my Tiger rods for leadcore and downriggers. They work great also, just a little more flex than the Power Pro. When I’m trolling, I’m looking for active fish on the graph. Over the summer months the thermocline on Lanier usually sets up in July and the top is around 27 to 35 feet. The top is where the bait likes to hang out. They have the safety of being at the edge of the thermocline and they are still getting some oxygen rich water. That’s usually where the action is, right at the top of the thermocline. That’s where the stripers like to feed. Sometimes the stripers work together on a school of bait. A small bunch of stripers will attack the bait sending it scattering and lurker stripers nail the scattering bait from the outskirts of the main bait school. Because of this feeding scenerio, trolling single baits on leadcore and downriggers work well. The single jig looks like a fleeing bait as it goes through the feeding zone. Right now the most popular feeding zone is 25 to 45 feet on Lanier. When I see fish feeding in the 35-45 depth I want to get my baits down to that area. I set my downrigger weights at 25 and 30-35 feet with a small jig and a larger jig. That’s when I start working the baits up and down. I believe that if you put action on your jigs and get them running up and down in the feeding zone you’re going to catch more fish. I achieve this by slowing, speeding up and turning the boat. Very Important: Keep in mind that you are pulling 275-300 feet of lead filled line. It takes a while for the action you create to get to the jig. You are actually putting waves in the leadcore line and it takes the waves a little while to get out to the jig. Start your action early and often. Another important topic is baits. I’ve heard a lot of folks say they are running leadcore at the proper depth but not catching the feeding fish. The tackle your using is important. I’ve always said you can catch feeding stripers on a dog turd placed in the right area at the right time, but the dog turd has to be the right shape and size and color. Size matters when trolling. If the fish you are targeting are eating 3-4 inch Threadfin, you’re probably not going to get many running a 7 inch paddletail through the feeding area. That’s why I use different size jigs when trolling. If something is working better, I’ll switch my baits to that size. At the depths that are being targeted, jig color is less important. I think that color tones are more important. Two tone baits work better for me. Flash is something that always helps in reaction strikes. I use a lot of flash on my jigs to help create a reaction. Sometimes flash helps for lathargic fish. Especially if fishing a group of inactive fish. Another important tactic I use is marking a school of feeding fish on my graph. As I get over the feeding fish, I’ll lay a mark on my GPS and work that area from different angles. Sometime you won’t get them the first or even the second time through so trying coming from different directions and varying speeds as you go. Very Important: Make sure you keep the baits in line with the fish you marked. I use dead reconing. I usually look at my heading and what’s behind me to stay in line and keep my baits in the right zone. I’ll make left and right turns but always coming back to the imaginary line I made to keep my baits in the right area. Here are my thoughts on summer mortality. If you put every striper you catch in your cooler those fish have zero chance of survival. One of the reasons I keep the boat moving while catching fish is to keep water flushing through the fishes gills. If you’ve ever Sail or Marlin fished, this same procedure is used to insure the fishes survival. It works and it’s the best chance for the fish to survive. I also slowly turn the boat into the fish to speed up the process of getting the fish to the boat. Almost every fish I catch has a good bit of fight left in him when getting to the boat, and swiftly getting the fish back into the water betters the chance of that fishes survival. If I see a fish swim away strong, I feel better about his chances. I don’t believe that every fish you catch in the summer is doomed to the bottom. 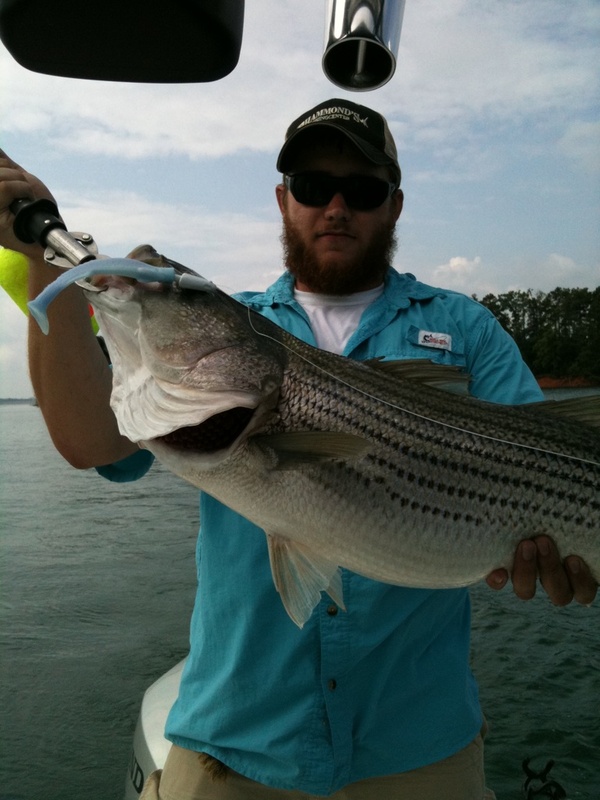 I got out yesterday to try and track down a few stripers with the trolling gear. It started a little slow but the bite picked up along with the wind. Most of the fish I found were suspended over deeper water and hanging around bait pods out in the wind. I caught most of my fish on the leadcore this morning with a couple hitting the downrigger. I fished the downrigger at 30 feet with a single bucktail and I used double bucktails at 7-8 colors on the leadcore. I think I ended up with 8 nice stripers for the morning. The chartreuese over white and blueback patterns worked the best for me. One of the reasons single bucktail trolling works well right now is because of the pattern these fish are on. Right now a lot of stripers are picking off single baits straying from a pod of bait over deeper water. I can see small groups of stripers doing the work of busting bait pods up and then single stripers hanging around the outside of the pod reeping the benefits. Stripers are notorious for working together to feed in this fashion. Trolling a bucktail through these feeding areas resembles a straying single bait and the stripers react to the moving bait. The trick is to have the right size and color tones for the clear summer water. Two tone bucktails have worked the best for me. Trolling doesn’t always work well. There are times when it just won’t catch fish. One thing that will improve your success rate is to match the size of what the stripers are feeding on. Right now it’s early in the summer. Bait is still growing and 1 ounce bucktails are just the right size. As summer progresses the bait will get larger. 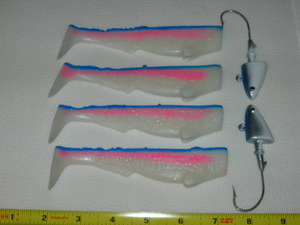 By summers end Stripers will be keying on much larger baits. I look for the trolling bite to be strong through Sept. The first video is about the tackle and the second is fish catchin. Have a safe weekend! I had a couple of good days trolling this week. Early week produced a few fish on the south end but Thursday was wide open. It started out slow down by the dam but when the generation cycle started I could see fish coming out of the deep timber to feed on the moving bait. Chartuese and blueback patterns caught the fish this week. In my opinion chartruese is the most effective color under bluebird skies. The blueback pattern runs a close second. I didn’t take any bait with me this week but it looks like the bait droppers are still doing well over bigger schools. Here’s a few videos I took this week. The summer trolling bite is starting to pick up and the stripers are moving south. The summertime trolling pattern is starting to set up as I’m seeing more and more fish moving over deeper water and and hanging out around clouds of threadfin shad. Find the bait and start looking for fish hanging around the bait balls. My rule of thumb is if I see more than 4 fish on my graph at one time I’m probably going to fish that area. Here are a couple of early summer trolling videos.